The Toshiba PX03SNB160 1.6TB SAS 3 SSD is meant for higher capacity storage platforms that endure heavy read workloads. Based on 19nm eMLC NAND these drives are rated at 1 DWPD for 5 years which is still a fairly impressive figure. The read optimized nature means that the use case for these drives are often file servers and media servers where data will be stored once then accessed many times. 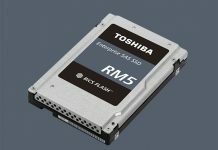 We already looked at the higher endurance Toshiba PX02SMU080 800GB SAS 3 SSD which is Toshiba’s higher endurance offering and we will add that to the list of competitive offerings in the benchmark charts. As we can see, highly threaded and sequential reads are the Toshiba PX03SNB160’s hot spot. 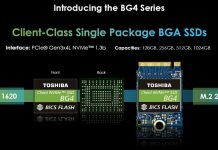 The drives clearly show their ability to scale performance beyond 6.0gbps offerings even on a single port configuration like we use. The Seagate 1200 drives were unable to do the same despite being 12gbps products. 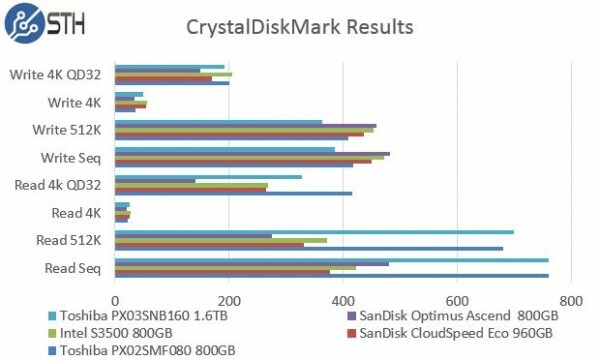 CrystalDiskMark shows similar patterns emerging. Write performance is clearly good, but not best in class. The read side is completely different with the only real competition in the chart coming from the other Toshiba SAS 3 offering. 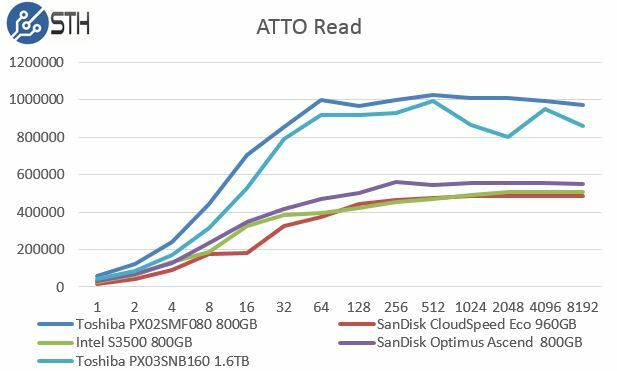 On the read side, we see excellent performance in ATTO touching the 1 GB/s mark. 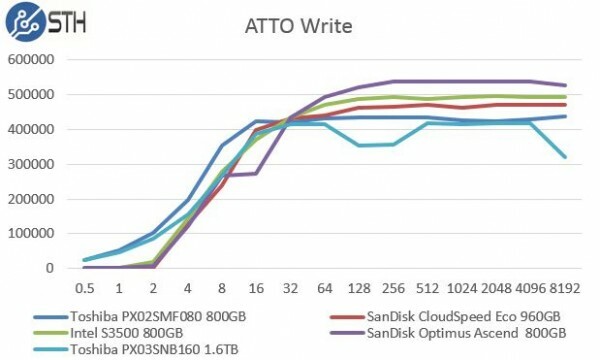 For higher-end SAS 3 drives, queue depths often need to be cranked up to around 128 in order to keep the controllers fed, and ATTO stops short of that. On the write side, we can see excellent performance at very low transfer sizes, much like the other Toshiba offering. The charts clearly show the read focus of these drives. 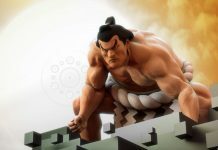 Overall, the Toshiba PX03SNB160 is a strong offering. 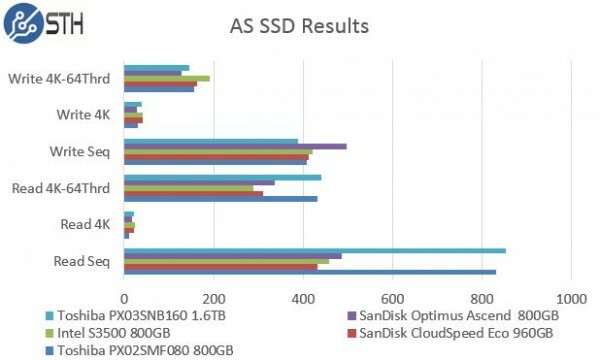 The fact that one can fit one of these 1.6TB drives in a 2.5″ bay makes it very competitive with nearline SAS 2.5″ storage in terms of storage density. For applications which are density constrained read optimized scenarios, these SSDs can provide much needed performance boots and high density.